Face the Chill in Style! It’s almost October and the weather is somewhere between notoriously dreary and grey. The season’s fashion scene, on the other hand, is anything but. While winter might still seem like a long way off, the malls and stores are already packed with chunky knits, gloves, and scarves. After all, lower temperatures mean more of everything, right? Wrong! Just because the thermometer has plummeted it doesn’t mean your style game has to drop, too. While we love bold and bright prints, gold, silver or metallic jewel tones can often be much more wearable. 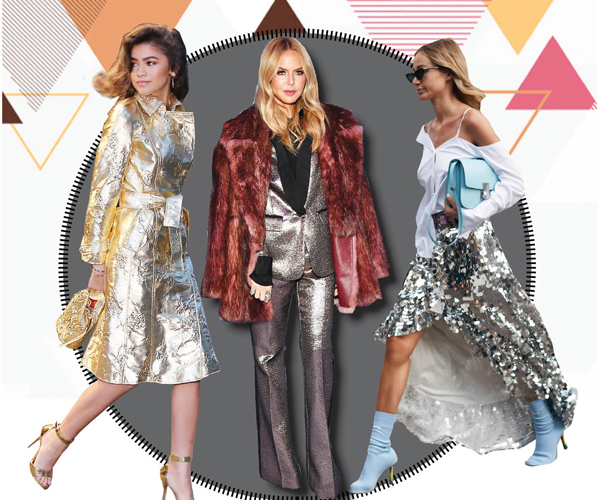 Metallics might sound a little intimidating when you’re used to wearing minimalist outfits, but it’s easier to ease into the trend than you think. These hues are nothing new, but recently we’ve been loving them and showing off new creative ways to wear them. A merrymaking staple, you can always count on a few shiny pieces to ensure that your fashionista title remains intact as you dance your way through parties galore. If you don’t want anything loud or overwhelming, add a metallic bag to an otherwise basic outfit. Right now, we’re loving a big metallic shopper. For beginners, grab a top with a plunging neckline and pair it with shoes or jeans with a little bit of metallic embellishments. Once ready to upgrade your wardrobe, try it in a dress shape that will elevate a weekend outfit without making you look like you tried too hard. When you’re fully committed to this trend, opt for a skirt. The best way to keep this look chic is to pair your maxi skirt with a fuzzy sweater or something more minimalistic, like a solid top. Adding a cool touch of an edge is also great. We’re especially loving the metallic top over a satin two-piece set. If you’re feeling particularly bold, opt for a metallic-style statement trench over a dress or around a jumper. A belted dress in metallics will work for the evening; choose a vintage-inspired texture for a new season update.